Product prices and availability are accurate as of 2019-04-24 20:48:02 CDT and are subject to change. Any price and availability information displayed on http://www.amazon.com/ at the time of purchase will apply to the purchase of this product. Bill and Cheryl Jamison, the "king and queen of grilling and smoking" (Bon Appetit), are back with a book that gets right to the heart of what makes outdoor cooking work: a great sauce. Twenty-five years of travel to the barbecue citadels of the U.S. and world, plus countless hours perfecting their craft as they wrote award-winning books on outdoor cooking, have yielded up a book that gives any ol' backyard cook the means to create championship-style BBQ with ease. 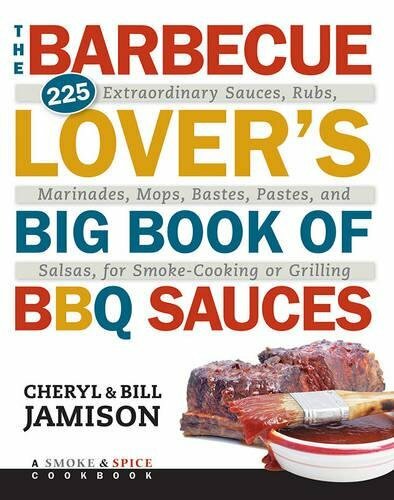 The Barbecue Lover's Big Book of BBQ Sauces is the first and only barbecue sauce book that caters to how outdoor chefs really cook. The book features 225 recipes, along with 4-color photography, for barbecue sauces, marinades, mops, pastes, dry rubs and more, along with detailed instructions on using a recipe for smoking, grilling, or both. Seventy of the recipes are for smoke-cooked BBQ; 55 are for grilling; and the remaining 100 are for either one - with specific directions on how to fine-tune the recipe for one or the other method. With sauces, rubs and marinades for all types of meat, The Barbecue Lover's Big Book of BBQ Sauces is a comprehensive companion for any backyard cook, with a range of recipes to suit any palate. 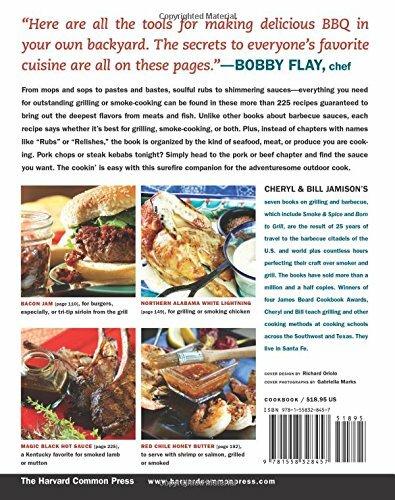 Chapters include sauce recipes for Beef and Bison; Pork; Lamb, Goat, and Veal; Game Meats; Chicken, Turkey, and Other Poultry; Fish and Seafood; and Vegetables. In turn, each chapter is divided into four sections: Dry Rubs, Pastes, and Marinades; Mops, Sops, and Splashes; Sauces; and Other Condiments - which include such things as chutneys, salsas, aiolis, flavored butters, and mayonnaises. Throughout the pages of The Barbecue Lover's Big Book of BBQ Sauces, readers will find lots of the Jamisons' patented take-it-to-the-bank wisdom and expertise on how to wrangle the best flavors from your grill or smoker, no matter what model you own or what kind of fuel you prefer. Their newest cookbook embodies both a down-home American sensibility, with loads of recipes rooted in the BBQ capitals of the Carolinas, Memphis, Kansas City, and Texas, and a spirit that reflects our current sophisticated global palates, with recipes from the outdoor-cooking traditions of the Middle East, Latin America, and East and Southeast Asia.